Indonesia lies in the so-called Pacific Ring of Fire, where tectonic plates collide. Jakarta: Indonesia has rerouted all the flights between Java and Sumatra islands as Anak Krakatau volcano erupted spewing columns of ash into the air, reported The Straits Times. A few days back, the volcano triggered a deadly tsunami in Indonesia killing over 400 people. “All flights are rerouted due to Krakatau volcano ash on red alert,” stated AirNav, a government air-traffic control agency. Authorities have extended the exclusion zone to 5-km after the volcano’s alert level raised to the second-highest on Thursday. The eruption of Anak Krakatoa volcano led to the collapse of a section of the crater which then slid into the ocean, triggering the tsunami, stated officials. As per the latest reports, the death toll due to the volcano-triggered earthquake in Indonesia stood at 429, with 1,485 people injured and another 154 still missing. Saturday’s tsunami was likely caused by Anak Krakatau’s volcanic activity and so could not have been picked up by sensors, which monitor conventional earthquakes responsible for more than 90 per cent of Indonesia’s tsunamis, said Dwikorita Karnawati, the head of Indonesia’s Meteorology, Climatology and Geophysics Agency. 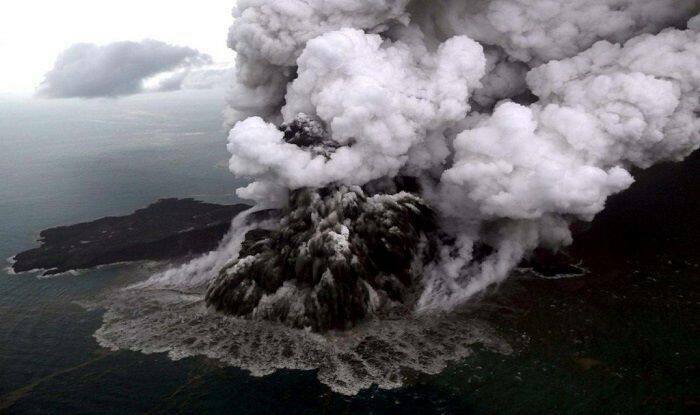 The eruption of Anak Krakatau, or Child of Krakatoa, a volcano in the Sunda Strait, is believed to have created a landslide on the volcano’s slope, displacing a large volume of water that slammed into the islands of Java and Sumatra. The tsunami decimated the area, ripping houses from their foundations and bulldozing concrete buildings. Indonesia, a vast Southeast Asian archipelago, is one of the most disaster-hit nations on Earth as it lies in the so-called Pacific Ring of Fire, where tectonic plates collide. Most recently in the city of Palu on Sulawesi island a quake and tsunami in September killed thousands of people. On December 26, 2004, a tsunami triggered by a magnitude 9.3 undersea earthquake off the coast of Sumatra in western Indonesia killed 220,000 people in countries around the Indian Ocean, including 168,000 in Indonesia.